For the better part of my life, I have been fascinated with sports stadiums. I have been fascinated with sports stadiums not so much for how they are operated, or constructed, or designed – but, rather, that sports stadiums are somehow meaningful. They are, as geographer John Bale argues, more than just utilitarian structures where games are played. We have imbued sports stadiums with particular meanings, values, and identities that we don’t do for many other places, save perhaps for our own childhood homes or monuments of national importance. We are, to cite another geographer Yi-Fu Tuan, topophilic about them – that is to say, we speak of them as very special places that, in many cases, we love. Indeed, this interest in the meanings of sports stadiums has driven much of my research in sport heritage, looking at why millions of people will travel thousands of miles simply to tour empty sports venues. In some cases, people go to them because of a famous event happened there, or a famous team or athlete plays there. Other times, it is because the stadium is particularly old, or has a unique design or aesthetics. But, often, the love of sports venues is because there is a personal connection to them – of games seen, and people we’ve gone to see them with. I’ve been very fortunate to tour numerous globally famous stadiums and, while many of them are important to me personally, few are as particularly special to me as Rexall Place (nee: Northlands Coliseum, Edmonton Coliseum, Skyreach Centre) in Edmonton, Alberta, Canada – which is most famous for being the home of the Edmonton Oilers hockey club. This week sees the final Oilers game played at Rexall Place, as the Oilers are moving to a new arena next season. The future of Rexall Place has not yet been determined though, whether it is renovated or demolished, it will have little resemblance to it’s current form. 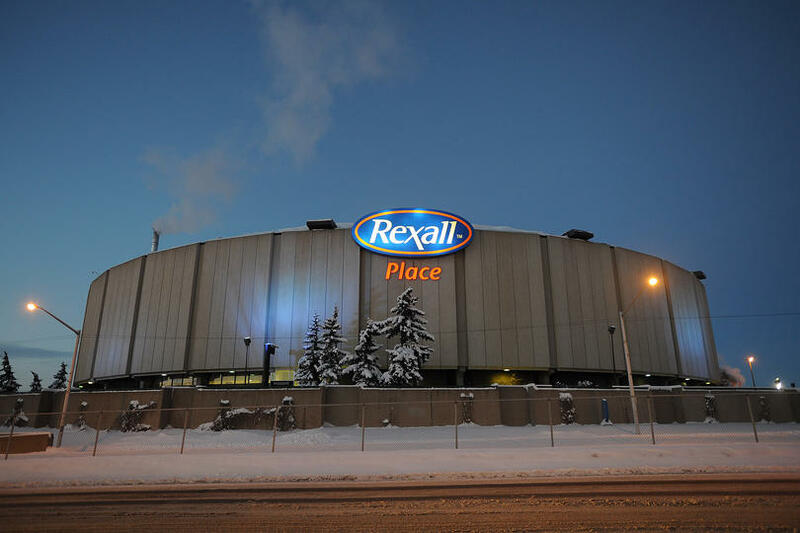 One of the ironic aspects of remembering Rexall Place, particularly in using terms like topophilla about it, is actually just how architecturally unremarkable it is. It is the epitome of the placeless, utilitarian venue both inside and out. And, yet, I can safely argue it probably is the most important symbol of personal heritage to me. It is a repository of so many memories, of events of all sorts – not just hockey – seen with so many loved ones. I can still vaguely remember my first game, and though the details of the game itself are somewhat lost (1980 or 1981, maybe. Definitely against the Bruins. And, I think, a 2-2 tie), I went with my dad, sat at centre ice about halfway up in the 200s (or the Blues, as we called them), from tickets he had bought from a scalper outside the door. I remember seeing demolition derbys at the summer fair with my family, Hulk Hogan wrestling cards with my best friend, innumerable hard rock and heavy metal concerts with high school buddies. But, inevitably, I come back to the hockey games, because those were the ones I still remember. And, I was at some pretty famous games: Game Five versus the Islanders in 1984 when they won their first Stanley Cup, and the relocated-from-Boston Game Four in 1988 when they won their fourth Stanley Cup. I should have seen them win the Cup in at Game Five in the 1987 Cup Finals as well – but, the Philadelphia Flyers had other ideas, though my brother got to see them win it in Game Seven a few days later. I was also at the infamous miss the empty net game, and the incredible Game Six victory over Detroit in the 2006 Cup run. There were, of course, many games – many seasons, even – that blur into memory. During the mid 1990s, when the building was half-full, my friend and I became defacto season ticket holders, as tickets were in very low demand and very inexpensive to obtain (not to mention we could sit almost anywhere we wanted). More than anything, though, I remember who I went with and, more than anything, those are the memories I have when I think about Rexall Place. My mother, father, and brother are who I think of most, and how hockey games were some of my best family memories growing up. Into my 20s and 30s, it was friends and girlfriends, when the hockey game was part of a night on the town. I considered coming back to Edmonton this season, just to see Rexall Place one more time. My brother and I, in particular, thought we would try and get some tickets near where our father’s tickets were in the 1980s – Section K, Row 14. Neither Section K or Row 14 exist anymore, the red seats removed during a mid 90s renovation, but I decided against going back. Perhaps because hockey is not necessarily a large part of my life anymore, or maybe because one last visit seemed unnecessary, I simply decided it wasn’t worth it. But I did slightly regret not going back one more time, just to be with my people in a place that meant so much to me for so long. However, last week, it all came around full circle. 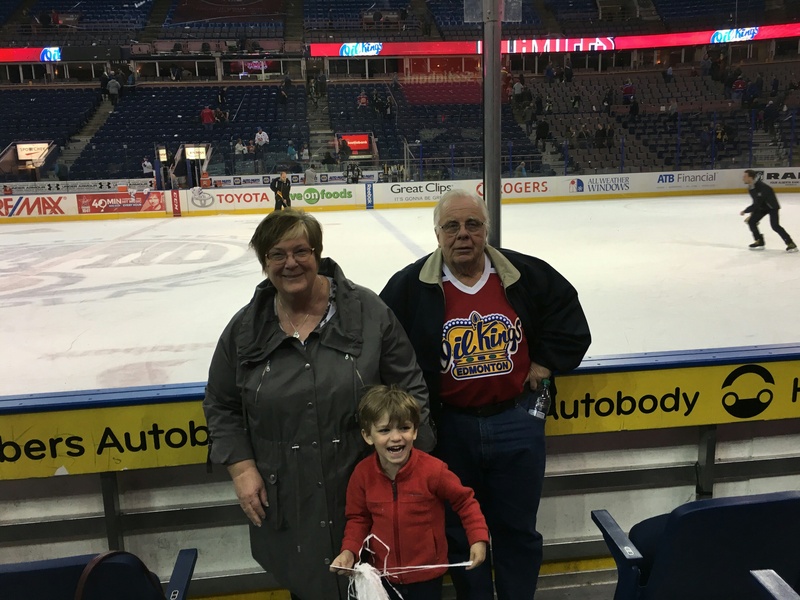 My wife and son went up to Edmonton to visit friends and family, and she decided to take our hockey-obsessed boy – along with my parents – for his first visit to the old rink. My son, born and raised in South Carolina, experiencing a place that meant so much to me, along with the people who took me for so many years. This is the way it should end. 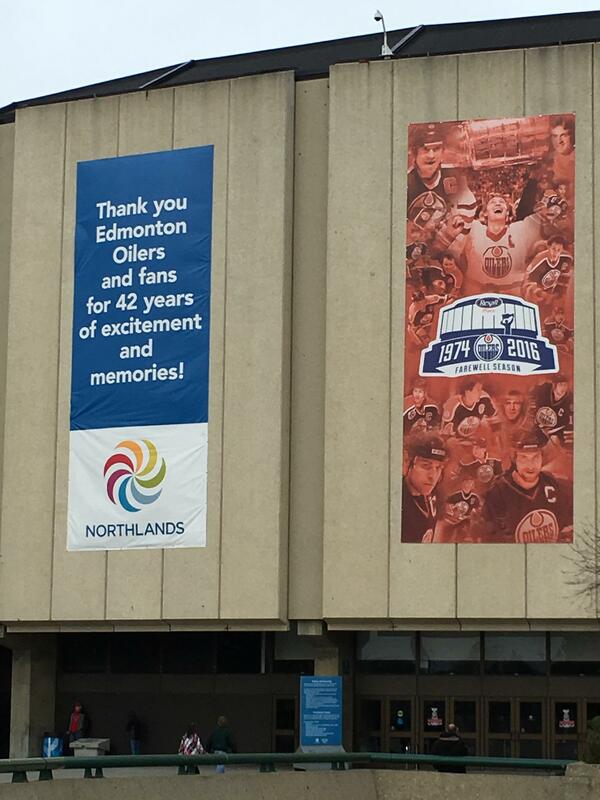 By Gregory Ramshaw in Edmonton, heritage, history, hockey, sport, sport heritage, stadium on April 5, 2016 .